That 1981 earthquake appeared to be the result of the earth's crust readjusting after magma oozed up through the fault and blew the mountain's top on May 18, 1980. See photos and read coverage of the 30th anniversary of the May 1980 eruption. Monday's quake was of the "strike-slip variety," said seismologist Seth Moran of the Cascades Volcano Observatory in Vancouver. The large tectonic Juan de Fuca plate is diving beneath the North American plate. At places, the plates get stuck together. An earthquake occurs when the plates slip past each other, releasing energy, he said. More than 900 people reported feeling the 10:35 a.m. earthquake, posting their responses on the U.S. Geologic Survey's "Did you feel it?" page on its website. No damage was reported. "I felt it, and certainly a lot of people here felt it," Moran said. "It was broadly felt, and, for a 4.3, that's appropriate, it was a decent-sized earthquake." 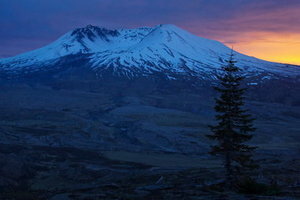 Mount St. Helens has rumbled and belched and quaked nearly every day since the May 1980 eruption, averaging one to two earthquakes a day, Moran said. In late January, a swarm of earthquakes was detected in the same general area as Monday's quake, known as the Mount St. Helen's Seismic Zone. The zone runs from Mount St. Helens 30 miles north to Morton, Wash. The largest quake in that January swarm was a modest magnitude 2.6, he said. Monday's quake, like those previous ones, occurred at a relatively shallow depth of about 3.1 miles. The quake doesn't presage another eruption, or another round of dome-building inside the crater like the action that followed a smaller magma eruption in fall 2004, Moran said. This one was simply a result of tectonic plates clashing beneath the earth's surface along the fault. Still, he said: "Anytime a 4.3 earthquake happens in this area, you pay attention because they're not that common. Realistically, we don't know exactly what's going to happen, but there's a reasonable guess that this was the largest event that we're going to see, and that's based on the fact that we've only had one event that's larger in the past 30 years."